This is the first post in a series on how to tune your drums. Check out the second post in this series about how to tune your snare drum by clicking here. I recently taught a class on drum tuning. I thought I would share my method of drum tuning. First of all, let me start by saying that these are my methods, and they work for me very well. I have a specific sound that I am trying to get out of my drums, and by using this drum tuning method, I am able to get exactly what I want out of my drums. 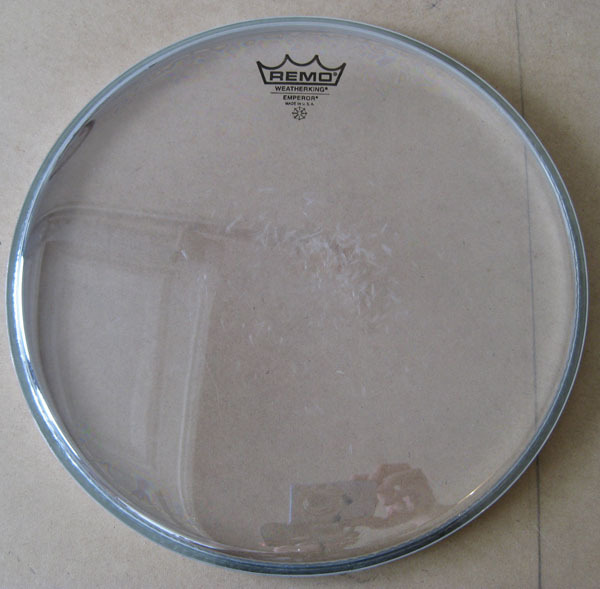 However, these drum heads and tuning methods may not be the very best for your specific needs. As a drummer and the “drum tech” for your drum set, I encourage you to always be looking for “your” sound. I’ve played drums for 17 years and I think that I finally have found my sound…but if I were to start playing with a different band next week, I might need to rethink my drum sounds to accommodate the specific style of music I would be playing. I mostly play rock/pop, high energy, drum driven music. I like deep, low, punchy toms. I like a my snare to have a fat crack and a little sizzle. I like my kick drum to feel like it’s hitting you in the chest. With that being said, let’s talk about drum tuning. Each and every drum has it’s very own sweet spot. This so called sweet spot is the tuning range in which the drum shell gives you most full and resonate note possible with that drum. In a live drumming setting, I try to tune my drums to this sweet spot. I really don’t believe in using devices such as the Drum Dial, or other drum tuning computers, because they do not hear what I hear, and like I said, each drum is different so (in my opinion) tuning a drum to a specific note forces the drum to be at a pitch which may or may not be the sweet spot on the drum. HOWEVER, when drumming in a studio setting where you have a little more control of the drums sounds in post production, tuning a drum to a specific note such as a note in the key of the song is a great idea and can help the song. I have searched for the right drum heads to get “my” sound for 17 years. I found what works for me, but you may have a different sound you are looking for. Use what gives you the sound your looking for. Now that you know some of my little drum tuning idiosyncrasies, lets talk about how to tune drums. Take off old batter head. Clean inside of shell with tack cloth to remove any dust or debris. Clean the counter hoop (rim) before you put a new drum head on. (Optional step) Wax the bearing edges using beeswax. Go around the edge with the wax, leaving wax on the edge, then take a cloth rag and massage the wax into the bearing edge to where it just feels smooth, yet waxy. This helps the drum head “seat” better and helps with tuning. Put new drum head on, finger tighten all tension rods, pushing down on the rim as you finger tighten them. You should have relatively even tension around the drum head when you are done. Use a drum key to tune up each lug to a “tight” feel, meaning no wrinkles in the drum head, and when you push on it, it is firm. You will want to use the star method, going from 1 lug to the lug directly opposite of it, then skip one and go to the the next one to the right…then directly across from it…so on and so forth. When the batter head has tight even tension, use your palm to apply pressure to the very center of the head, this “seats” the drum head, and also pre-stretches it so that it will de-tune much less when you are playing it live. “Tap tune” about 1″-2″ from each lug. You are looking for the lowest pitches, and when you find them, you will tune them up to the highest pitch lug. Repeat steps 6-7 until when you stretching your drum head, it no longer de-tunes…or at least until the de-tuning is very little. I like to tune my batter head (and resonate head) to the lowest possible full tone pitch. For Resonate heads, that usually means just barely above finger tight, and for the batter head that is usually somewhere above the resonate head. Find the sweet spot on your drum. This may mean that you spend 30 minutes or an hour going up in pitch and going down in pitch in very slight increments, noticing how it changes the sound of your drums. Use your ear to find that sweet spot. For this, you don’t necessarily need to tune ALL the drums lugs for each round of tuning. Try just loosening 1 or 2 lugs, and hit the drum to see how it effects the pitch. Some drummers think they need to turn the drum key 1/4 a turn on ALL of the drum lugs if they do it to one, but that is a myth. I hope that helps you with tom drums. I’ll be working on getting some videos made of my tuning process, and I’ll also be posting drum tuning how to articles for tuning your bass drum, and tuning your snare drum. Stay tuned! Do you have a question about how to tune your drums?